This article covers the information released so far about Cainhurst Castle. For an overview about the story so far, see this article. 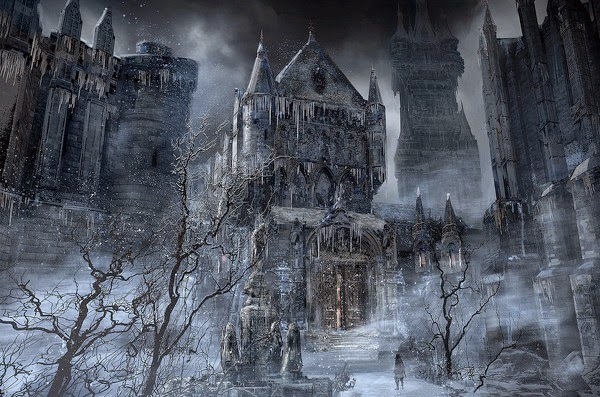 Outside of Yharnam stands the deserted Cainhurst Castle. The castle was once home to a family of nobles, “bound by their bloodlines and by-the-book when it comes to their traditions”. They disappeared suddenly and without a trace, with only this frozen over castle standing as proof of their existence. What happened to the nobles that resided at Cainhurst Castle? When did the noble family disappear? Was it before or after the beast plague came to Yharnam? If this translation is accurate, is there significance in the wording of the Famitsu article describing the castle when it says, “bound by their bloodlines and by-the-book when it comes to their traditions”? Is the frozen nature of the castle a natural condition, or is it something more?